When was the last time you scratched a note out in longhand? I mean take a pen, pencil or pocketknife and wrote something on paper, your hand or a bathroom wall. If some of the pundits are to be believed, handwriting is a lost art. Another casualty of the digital age. According to an article on the Daily Mail (yeah, British press), the average adult hasn’t handwritten anything in more than 40 days. Anything. And if you take away what used to be the day-to-day jottings of adults — I’m thinking of those notes to yourself, grocery lists, phone numbers on a matchbook cover — only a third of adults actually sat down to write something in the past six months. As I recall it in grade school (and my folks would be glad to fill in any gaps in my memory), my handwriting was beyond horrible. I seemed to lack the coordination (or the interest) to form my letters well, and things did not improve much when we learned the Palmer method of handwriting in third grade. By sixth grade I largely abandoned the Palmer teachings and reverted back to printing, which by then was a lot more readable. To this day I employ a half-printed, half-cursive hand, readable in most instances and instinctive enough that I can take notes without looking at the paper and still be able to understand it later. My penmanship (another wonderfully descriptive word that no one hears any more) is far from elegant, but it’s functional. As far as my legal signature, forget it. You can’t read it. I got that honestly; Dad’s signature looks a lot like mine, like a Volkswagen that had been hit by a train. But you’re not supposed to read it. Years ago I knew this guy from the Middle East; he spoke fluent English without an accent, was thoroughly westernized. But he signed his checks in Arabic, starting in the middle and working outward. You don’t see anyone trying to forge that, he told me. But now, there’s little call to write anything down. Pens and pencils may soon go the way of clocks with hands and landline telephones — cool to have, but some training may be required. Think about it. We haven’t had to write long things out if there was a computer (or before that, a typewriter) handy. Now we have smartphones. Just tap your note on that, save it to something like Evernote. Don’t need any pen. Or paper. Or pockets, for that matter. Don’t even need to do much scribbling when you’re dealing with a bank or signing a contract any more. An e-signature takes care of the latter (just type your name), and nearly all bank transactions are electronic these days. The only check I write each month is to my landlord, and that’s only because he’s a Luddite. I find I’m more of an anomaly these days because I do some of my writing in longhand. Notes are taken on index cards. First drafts go on yellow lined paper. Journal entries go in a leather-bound book, written with a fountain pen. But more and more, the tech bug creeps into my life and I’m going more to the digital tools. Can’t remember when I last wrote a real letter, and I used to write some great ones. But everything’s by email now. If it wasn’t for my rent check and a few publishers who prefer hard copy when I’m pitching a story, I wouldn’t use the postal service at all. I can’t rightly say I keep a paperless office, though I’m moving more that direction. A blessing, considering how I am with clutter. But the stacks of index cards and 5×8 legal-pad sheets lying around my desk bear proof that I still use paper and pen. Reckon if you still write, you just might be a dinosaur. LOL (laugh out loud), U (you) and FYI (for your information) are the most regularly used abbreviations. Today, creating a shopping list, taking notes in a meeting or even wishing someone a happy birthday are more often done via electronic means. One third said when they do write something down, they often struggle to read their own writing when coming back to it later on. And nearly half (44 per cent) said that their scribing is neither nice nor easy to read. One sixth of Brits don’t even think handwriting should still be taught in schools. One in three Brits describe handwriting as ‘nice’ but not something they would want to do every day. Do tell. When was the last time you wrote something out? Let me know in the comments. If you get a note from the IRS (Eternal Revenue Service), it’s usually not a good thing unless it comes with a check. But if you get an email from the IRS, you should really pay attention. It might not be them. The message “Your Federal tax report #ID9837” from Internal Revenue Service (customer.service@irs.gov) contained a virus or a suspicious attachment. It was therefore not fetched from your account editor@ericpulsifer.com and has been left on the server. If you wish to write to Internal, just hit reply and send Internal a message. OK. Here’s the deal. Whoever it was sent it to my business email address, which hasn’t existed very long. See, all my emails feed directly into my gmail box, making it easier to keep track of stuff and handle all my addresses without having to log in and out and in and out. Email addresses are cheap. Please submit a request of the tax refund and a processing of the request will take 7-14 days. A tax refund can be delayed by different reasons. For instance submission of invalid records or sending after the deadline. Please find the form of your tax refund attached and fill out it and send a report. That’s the email, and it’s pure horse dung. I didn’t even bother to open the attachment. But as far as phishing/information mining/scamming goes, it’s an oldie but goodie. This e-mail is a hoax. Do not follow the provided link. lose your card(s), contact the issuer immediately. Looking a little further, I checked from the jackass’ mouth itself, going straight to the IRS website. I pasted it directly in here, so it may look funky. Phishing is a scam typically carried out by unsolicited email and/or websites that pose as legitimate sites and lure unsuspecting victims to provide personal and financial information. However, if you have experienced monetary losses due to an IRS-related incident please file a complaint with the Federal Trade Commission through their Complaint Assistant to make that information available to investigators. If you clicked on links in a suspicious email or phishing website and entered confidential information, visit our identity protection page. Forward the email as-is, to us at phishing@irs.gov. After you forward the email and/or header information to us, delete the original email message you received. Please forward the full original email to us at phishing@irs.gov. Do not forward scanned images of printed emails as that strips the email of valuable information only available in the electronic copy. You discover a website on the Internet that claims to be the IRS but you suspect it is bogus … … send the URL of the suspicious site to phishing@irs.gov. Please add in the subject line of the email, ‘Suspicious website’. You receive an unsolicited e-mail or fax, involving a stock or share purchase … … and you are a U.S. citizen located in the United States or its territories or a U.S. citizen living abroad. Please add in the subject line of the email, ‘Stock’. … and you are not a U.S. citizen and reside outside the United States. Please add in the subject line of the e-mail, ‘Stock’. You receive an unsolicited fax (such as Form W8-BEN) claiming to be from the IRS, requesting personal information … Contact the IRS to determine if the fax is from the IRS. If you learn the fax is not from the IRS, please send us the information via email at phishing@irs.gov. In the subject line of the email, please type the word ‘FAX’. You have a tax-related question …Note: Do not submit tax-related questions to phishing@irs.gov. If you have a tax-related question, unrelated to phishing or identity theft, please contact the IRS. … request detailed personal information through email. … send any communication requesting your PIN numbers, passwords or similar access information for credit cards, banks or other financial accounts. You receive a suspicious phishing email not claiming to be from the IRS … Forward the email as-is to reportphishing@antiphishing.org. You receive an email you suspect contains malicious code or a malicious attachment and you HAVE clicked on the link or downloaded the attachment … Visit OnGuardOnline.gov to learn what to do if you suspect you have malware on your computer. You receive an email you suspect contains malicious code or a malicious attachment and you HAVE NOT clicked on the link or downloaded the attachment … Forward the email to your Internet Service Provider’s abuse department and/or to spam@uce.gov. Are you having trouble downloading a PDF? If you’re into links, here’s the IRS announcement. So I’m not going to open this attachment. I’m not going to bother. I know they don’t owe me a refund, and if they did they’re not going to tell me unless I ask. What do I think they are, stupid? So if you get an email from the IRS, forget it. It’s not them. A cartoonist for the Conservative Daily News caught the mood just right here. New Yorkers may soon need to grab a refill if they want to consume mass quantities of soda. That is, if Mayor Michael Bloomberg has his way. It’s just another day at the office for Hizzoner. Since taking office, Bloomberg has opened fire on smokers, trans fats, salty snacks and soft drinks. This latest has Bloomberg calling for a ban of sugared drinks in anything larger than 16 ounces, no matter what the majority of voters say. So much for the famous Bladder Buster, or whatever it is your favorite convenience store calls its 40-plus-ounce Mt. Dew. Even the 20-ounce bottle, which is the new standard size for soda, has to go. Keep your nose inside the vehicle at all times. Meanwhile, in New Jersey — which is really New York South though no one will readily admit it — is considering another out-of-left-field law that will prohibit the family dog from riding in the passenger seat with his head sticking out the window. Pets must be restrained when in the vehicle, maybe even with a harness. I don’t live in New York. I’ve never been there, and I have no desire to ever go there as long as I live. I could say I don’t understand the Bloomberg way of governance, but that would be a lie. I grew up in California, which is about like New York except the sun occasionally shines. It’s my California experience that keeps me from laughing as I read about the latest Bloomberg Follies and about New Jersey’s proposal. I’ve seen too much, and California wrote the manual on how to be a proper Nanny State. Even New Yorkers laugh at Californians. But New York and California are the incubators for many of our national problems. Folks talk of street gangs now as if they’re the newest threat to our way of life; they’ve been around New York even before I was born. Illegal immigration used to be a California problem; now it’s even in the Carolinas and yes, the Midwest. Same thing with some of the laws you used to laugh at. Now you’ll have a problem finding someplace to smoke indoors or make a phone call while driving, and many of those laws started because someone in New York or California complained. A state with a lot of immmigration — like South Carolina — tends to adopt these laws faster than someplace like South Dakota, which isn’t exactly a hot immigration magnet. Part of it is a natural thing. We California-bred types like our Mexican food, and New Yorkers like the idea that they can call someplace and have a slice of pizza and a bagel delivered at 4 a.m. Except I still can’t find any Mexican food that is even close to the real thing out here, and the 4 a.m. pizza/bagel runs haven’t materialized yet. But we’ve got their laws. And we’ve got politicians who think they know what’s good for me better than I do. Something obviously got lost in the translation. If you want to know the future here in these United States, cast your eyes on New York and California. It’s better than a crystal ball. Just hide your Bladder Buster when you see a cop, and make sure Fido’s paws and tongue stay inside the vehicle at all times. Android’s built by Google, right? So what if you want to use Bing, Yahoo! or DuckDuckGo for searches? Both articles appear in No Brainer App Reviews. I found this while hunting up graphics for something else. Dizzy Gillespie finds his way to Google fame. I got my first telephone in the late 70s. it was olive green, had a dial on it, came with that newfangled “modular” plug-it-in-anywhere wiring, and I bought the durned thing. Buying a phone. This was something new then. It gave the consumer some choice, but it also released the phone company — Pacific Bell in my case — from having to maintain the handset. They didn’t have to worry about repairing or replacing your handset if you slam it against the wall in a fit of rage. I’ve bought a lot of phones since then, but it seems quite a few people are still renting theirs from their phone companies. Like hundreds of thousands of phone users. Renting? Didn’t that go out with the rotary dial? Well, kinda sorta. The idea of buying your own phone started to catch on for real when Ma Bell broke up in the early 80s. But some still hung on to their old equipment, four-pronged plug and all. I’ll say this. Much of the older gear was built. One of my parents’ extension phones was an old black metal-bodied rotary-dial number, branded by Stromburg-Carlson. Like my old Canon AE-1 camera I stubbornly held onto until it became harder to find film processors, this thing was built like a brick outhouse. Like a Sherman tank. I’ll bet if you dug it out of the garage now and plugged it in (good luck with that given the old four-prong plug) it would work just fine. There were no parts in there to screw up. If those of us who ditched the landline in favor of cell phones are the ultramoderns, those who continue to lease their house phones are the traditionalists. Provided, of course, they a) can find that rented phone and b) it’s still in use. But according to The Consumerist, many are still paying to rent a phone that is no longer being used. Monthly phone rentals, according to the site, range from a dollar per month to more than $20, depending on the carrier. If that’s the case, don’t expect the phone company to bring it to your attention; only a fool would shoot a cash cow. Anyway, check your phone bill, especially if you’ve had that service for decades (not unusual if you own your home or lived in the same place for a decade or three). Decipher it, go through all the line items. If it shows you’re still paying for a phone rental, you’ve either got one of those phones that will outlast you, or you’re more than likely being hosed. If you’re a security officer, all I can say is … I feel your pain. This is according to a site called CareerBliss, which ranked the top 20 happiest and 20 unhappiest jobs you can work. And the security guard’s post is, well, right at the bottom of the dungpile. I guess it depends on where you work, too. I’ve never worked a security gig myself. But in my days as a casino employee I got to know some of the security folks. Perhaps there are worse security beats than on a casino floor, and that town didn’t really have a police department. The security workers were the cops. Maybe that counts for something, because most of the casino security guys seemed to like their work. Or maybe you just had to be warped enough to handle it. Factors such as pay, work environment and job resources (such as support) were considered in this study, which ranked non-top-executive jobs. Registered nurses and teachers took the second and third unhappiest spots. Now, these are jobs that carry plenty of their own rewards (especially for the altruistic among you), but job support may be lacking and the pay probably not enough to compensate for all the work-related headache or heartache. The happiest occupation, according to the study, is software quality assurance engineer. It’s gotta be the pay, right? Strangely enough, others included in the happy-zone top 10 are customer service reps, administrative assistants, and accountants. And human resource managers. OK. Definitely gotta be the pay. I can’t think of anything else. There are lots of reasons for a person to want to quit Facebook, but objections to how insanely rich it made its founder isn’t one of them. But as the social media behemoth prepares to go public and make what could be a record-shattering IPO (that’s “initial public offering” for those of us who put our money in CD’s of the Miles Davis and Willie Nelson variety), folks appear to be storming the exits. There’s even an I’m Not On Facebook Twitter feed and website, though it appears the people behind thee site are more interested in hawking T-shirts than anything else. But the objection is that Mark Zuckerberg used to be one of the guys; now he’s a porcine one-percenter. He’s committing the grevious sin of making a pantload of money from Facebook. OK, what’s the problem? More power to him. I have my own negative feelings about Facebook and did shut my account down for a year before restarting it. It can be a colossal waste of time. By its very nature it shoots your privacy out the window. The user leaves himself to be flamed, cracked, stalked and generally violated with just a few mouse clicks. You have to use filters to screen the good information from the usual junk. Many third-party apps are malware just waiting to happen. And each new innovation puts your life a little more out in the street — like what’s that option that allows you to share everything you read online? But it’s still fun and somewhat useful. Many of my friends use Facebook as the only way to communicate, eschewing even anachronisms such as email. There are some real blasts from my past among my Facebook friends, including old running mates from decades ago, former co-workers, kinfolks, some old girlfriends (awkward), even an ex-wife (tres awkward). Many of my blog readers come from my Facebook ranks, and the whole thing is good for business. I won’t knock that. So Mark Z can probably buy WalMart instead of shopping there. Anybody have a problem with that? Facebook isn’t my go-to social media site, though. Not even close. I spend more time on Twitter than any of the others, and tweeted incessantly during the last few minutes of the Super Bowl (a barnburner of a game — I tweeted that the game was so nerve-racking, if there was a toilet on the 50-yard line the players would be using it). I use Linkedin for professional contacts and get a lot of mileage out of the groups. I enjoy Google+ and picked up some story ideas from Quora. But come on! So Zuckerberg won’t ever have to work at a WalMart as long as he lives; he might be in a position to buy the whole schmeer. Like who cares? Get a life! He came up with a product that at the time was far better than anything remotely similar (remember how long it took to load a Myspace page?). People like his product. He’s created value, whether real or perceived, and the users number almost into the billions. Apparently he’s doing something right. I was once accused of wealth envy because my computers run Linux instead of Windows. Ain’t necessarily so. I have no problem with gazillionaire Bill Gates. I just find Linux meets my needs and allows me to really customize my system and use free software. It’s funny hearing some Mac users decry Gates and his billions, though the late Steve Jobs could afford to buy his black turtlenecks by the shipping container. But I digress. I don’t mind the one-percent gang. I wouldn’t mind working for some of them. With those folks I stand a better chance of making my exorbitant asking price. I won’t have to worry so much about whether the guy is going to vanish come billing time, or whether the check would bounce. Instead, it’s a straight value-for-value transaction, and a rich guy (i’m talking self-made here; I don’t count the trust-fund brats in this equation) would understand this concept better than anybody. But quitting Facebook because it’s printing money for Zuckerberg is the wrong reason. Spin again to find another excuse. How much does the Internet know about you? You’re surfing your favorite sites, and the ads seem to be for places that are awfully close to where you live, and for products/services you are interested in. It’s almost accurate to say the Internet is stalking you. It sees you when you’re sleeping, it knows when you’re awake. It probably knows what sites you surf, and what you’re using to surf these sites. These goofy graphics aren’t anything new. I had these up for a long time on my old blog, and I’ve been meaning to put them up here for some time. Now’s my chance. Syndicated tech columnist Kim Komando recently ran a piece on this, along with a link to a site that is powered by ip2location.com. When you click on the button below, it’ll bring you to the site with some really interesting information. OK, the linked site has the Kim Komando brand all over it, but … well, admit it, she’s not half bad to look at. As I linked this into a social media site (Google+), I saw some of the values in the above box change. I don’t know if it will keep my information or read back yours. Probably the latter. Hmmm… We were not able to detect any social networking sites that you’ve visited recently. Sites must exploit a Web feature to see your history. By default, browsers display links you’ve visited in a different color. And sites can see how a page looks on your computer. If a link changes color, the site knows you’ve visited that link. Using special code, a site can check more than 25,000 links per second! This page only checks to see if you’ve visited a handful of sites. If nothing is listed above, you haven’t visited one of the sites we checked (or you recently cleared your browsing history). 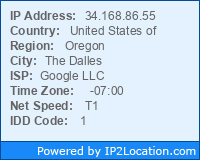 If you check the ip2location site itself, you might also find it quite interesting. I saw that Net Speed entry on my readout (it says DSL) and this probably explains a bit. The wireless connection at work is really poky. But it’s a decent fringe benefit. I will take the rest of the Komando readout to mean my computer is more secure than most. Unknown operating system, default browser, no history of sites browsed. Very good. Excellent, in fact. The more “unknowns” your readout has, the better. You put enough of your business out there as it is.